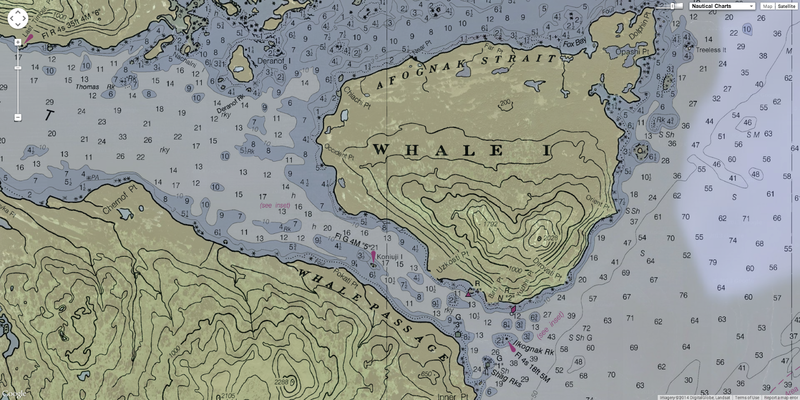 NOAA Ship Rainier recently surveyed Whale Passage, which separates Whale Island from Kodiak Island, Alaska. The area has never been surveyed with modern full bottom coverage methods, and some project areas were last surveyed by lead lines around a hundred years ago. The area frequently experiences 7 knot currents, making rocky or shoal areas particularly treacherous. Whale Passage is a high traffic area for fishing vessels, U.S. Coast Guard cutters, barges, ferries, and small boats, which is why updating the area’s nautical charts is so important. Strong currents push around Ilkognak Rock daymark at the entrance of Whale Passage. The dynamics of the passage and surrounding area create several challenges for the hydrographic survey teams. The local tidal and current models are not well-known. To resolve this, Rainier was instructed to install four tide gauges in the greater project area, compared to a typical requirement for one gauge. Two of these gauges are a mere 4.5 nautical miles apart, in and just outside of Whale Passage itself. Some areas are so narrow and experience such high currents that it is only possible to survey in one direction in order to maintain control of the launch. The coxswain must plan each turn carefully, to avoid being pushed into dangerous areas. Ideally, these areas would be surveyed at or near slack tide. However, the slack in this survey area is incredibly brief and the predicted slack periods did not match what survey crews saw in the field. Rainier‘s multibeam sonar data shows a sunken fishing vessel in the vicinity of Whale Passage. The bathymetry is so dynamic that, even in relatively deep water, boat crews must remain alert for rocks and shoals. The survey teams found several large rocks in locations significantly different from where they were charted. Furthermore, the presence of large kelp beds increases the difficulty of surveying: they can foul the propellers on the launches, add noise to the sonar data, and can also obscure the presence of rocks. While the work within Whale Passage, and the neighboring Afognak Strait on the north side of Whale Island, is challenging, it is also high-value. In addition to correcting the positions of known rocks and hazards, Rainier and her crew found a sunken vessel. Most importantly, though, they found areas that were charted twice as deep as they actually are. When the chart reads 8 fathoms (48 feet) and the actual depth is only 4 fathoms (24 feet), commercial traffic utilizing the passage could be in serious danger of running aground. Thus far, Rainier has submitted two DTON (danger to navigation) reports for depths significantly shoaler than charted. These new depths are already published on the latest version of chart 16594. NOAA Ship Rainier will continue to survey the vicinity of Whale Passage, as well as the waters near Cold Bay out in the Alaskan Peninsula, for the remainder of the survey season before heading home to Newport, Oregon.